"Two teams of researchers have proposed the existence of an unseen planet or a failed star circling the Sun at a distance of more than 2 trillion miles, far beyond the orbits of the nine known planets. The theory, which seeks to explain patterns in comets’ paths, has been put forward in research accepted for publication in two separate journals." I believe this is the precursor to something quite extraordinary, the implications of which are unknown to the many astronomers hoping to be the first to discover this planet or failed star. The basis for my belief lies far back in history, from myths and data recorded by our very earliest civilisations. This proposed synthesis of myth and modern science lead us in a remarkable direction. These two astronomers have come to similar conclusions about the existence of another planet in our Solar System through work done quite independently of one another. Dr Murray places the body, larger than Jupiter, in an orbit 32,000 AU, or 2.98 trillion miles from the Sun. Meanwhile, Dr Matese considers that the planet might be a brown dwarf orbiting at 25,000 AU. Their conclusions are drawn from their studies of the observed perturbations of the cometary cloud. In other words, the long-period comets’ trajectories into the inner Solar system are non-random and best explained by the gravitational effect of a massive body sweeping through the Oort cloud, the spherical field of comets wrapping around our star system. I am quite certain that this information will have triggered a renewed effort in the astronomical community to find Planet X. Which astronomer would not wish to go down in history as the discoverer of another planet around our Sun? Many would be openly critical of the predictions I am about to make regarding this celestial entity, but the conclusions I draw are scientifically based and quite precise. If they were proven accurate, then these findings would further support my other, more controversial speculations. Dr Matese alludes to the possibility that the planet may, in fact, be a brown dwarf. Brown dwarfs were, until recently, only theoretical planet/star hybrids. Astronomers believe that they have now located some brown dwarfs, whose luminosity is so low as to make their detection extremely difficult. Essentially, they are the product of an accreting gas cloud that is several times more massive than that which eventually made Jupiter. 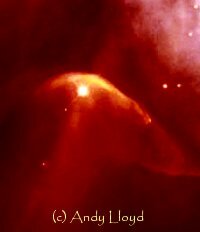 Beyond a certain threshold of mass, reactions within this world lead to the emission of heat and a minute amount of light, but the body is still too small to set off the thermonuclear chain reactions that ignite a conventional star. They appear a dull red, contrary to the colour that their name would suggest, and do not increase beyond the spherical dimensions of Jupiter, despite having a greater mass. They are thought to be relatively commonplace in the Universe, and their relative lack of appearances thus far reflect their dark star qualities. If one is in orbit around the Sun, then it is quite plausible that its detection by telescope has not yet occurred, so one can understand the paucity of tangible data from further afield. But as we become more able to detect and observe planets around other stars, so will our ability to observe this maverick in our own system increase. The sensational aspect of all this is when one starts to consider this world as a very dim star, rather than a planet. The implication is that we are in a binary star system! Of course, the brown dwarf alluded to is not a star in the conventional sense, but it may emit enough light and heat to make possible moons around it life supporting. Considering its distance from the Sun in the extreme cold of the void, that possibility is an exciting one. It is certainly the case that any terrestrial planet that far from the Sun would not be able to support life on its own. An additional source of heat or light is required. Okay, so such a finding would be an interesting astronomical discovery, but surely would have little impact on our lives in general. Well, that rather depends on whether there is some additional meaning attached to a brown dwarf orbiting the Sun. Last August (1999), UFO Magazine (UK) published a letter of mine proposing the future discovery of such a celestial body. I specifically predicted the discovery of a brown dwarf in the Oort Cloud. This proposal was in response to Alan F. Alford's critique of the existence of Nibiru, a concept that had been the basis of his own first book. My prediction was based on ancient myth which described this member of our Solar System in sufficient detail to bear a close resemblance to a brown dwarf (See DarkStar2). Naturally enough, I was somewhat encouraged by the findings of the two astronomers published a couple of months later. When most people think of ancient societies they tend to think of Greeks and Romans. Asked to think of times before that, they might offer the ancient Egyptians. Many are unaware that the first civilisations appeared in Mesopotamia, modern Iraq, some 6000 years ago. They may also be unaware of the fact that these first civilised peoples, known as the Sumerians, developed an advanced society, complete with cuneiform writing, a complex religion, advanced architecture, book-keeping, mathematics, medicine, astronomical knowledge and law. This civilisation appeared in vitro fully formed, rather like the ancient Egyptians emerging in the following millennium, whose earliest pyramid building created some of the finest monuments on Earth. These fully fledged civilisations, appearing out of nowhere, seem to many to point to an unknown, lost civilisation which passed its knowledge and experience down the ages in some way. There are two possible answers to this dilemma, both wholeheartedly rejected by mainstream science. Firstly, the myth of Atlantis, and, secondly, the intervention by non-human intelligence. Science derides both of these ideas as fanciful rubbish, aimed at a mass audience who are prepared to part with their cash in exchange for a flight of fancy. Science probably has a good point when discussing many of the later civilisations and their mythology, many of which simply developed the Sumerian knowledge in a natural, evolutionary way. But the Sumerians were quite clear about where they got their scientific knowledge and social infrastructure from – the gods who lived on Earth before them. These gods were described in their historical records in a tremendous amount of detail, as if first hand knowledge existed of them. This story is told by the scholar Zecharia Sitchin, who translated many of the earliest cuneiform texts, and stunned the world with his controversial interpretations. The Sumerian gods, known as the Annunaki, came to Earth in prehistoric times, from their home-world of Nibiru, with the intention of setting up a terrestrial base and mining gold, an essential commodity on their planet. Several hundred of them lived on Earth , cut off from Nibiru for all but one year in every 3600 or so. They toiled away for tens of thousands of years until their sufferance lead them to innovate technologically. To lessen their workload they genetically engineered a hybrid of themselves and one of the local species of man-ape. These hybrid workers were humans, an intelligent, but sterile cross between the god-like extra-terrestrials and Earth apes. In time, the Anunnaki tired of having to give birth to these IVF hybrids, and mankind was gifted with the ability to procreate. This was probably the biggest mistake the Anunnaki made, as mankind proliferated to threateningly large population levels. This account of our origins is clearly the Mesopotamian precursor to the Biblical story of the Garden of Eden. In fact, the Sumerians called the land worked by humans E.DIN. Eventually, Mankind was almost entirely wiped out by the Flood, an event foreseen by the Anunnaki, who fled the Earth and watched the demise of their cities and their human slaves in utter horror. They were able to predict the coming Deluge because it occurred as a result of environmental impact on the Earth caused by the passage of Nibiru. This may have been through accompanying cometary impacts causing a tsunami, or through the dislodging of the Antarctic ice cap, or possibly by global crustal displacement. This story has overtones of the Atlantean myth. The Biblical Flood myth also has its Mesopotamian counterpart in that some of the gods, sympathetic of the coming catastrophic plight of mankind, warned a holy man called Ziusudra to build a submarine/Ark, and safeguard his family and livestock within it. The other gods, worried about the runaway success of mankind, had decided to leave their human slaves to their fate, as a convenient way of ridding themselves of the mounting threat. Following the Flood, the shocked Anunnaki decided to allow the surviving humans to live on Earth and spread across the globe. In time, the power of the technologically superior, but vastly outnumbered, immortals waned on the Earth, mostly as a result of destructive in-fighting, and they largely returned to their own world. Man was left to his own devices, with only the gift of knowledge bequethed by his departing masters to show for their Lordly, but negligent parenthood. And so human history began, with the memory of the gods passing into myth with every successive generation. Only now, as modern science catches up with the prehistoric knowledge, can we recognise the true meaning of the myths, 250 generations later. The other aspect of Sumerian mythology covers cosmology. Their creation myths allude to the formation of the Solar System and a momentous reformation 4 billion years ago. Their science included heliocentricity, a knowledge of all nine presently known planets (! ), and the inclusion of the Annunaki’s home-world. As the Anunnaki counted the Moon and the Sun as planets, Nibiru was known as the 12th Planet. We would understand it better as Planet X (alluding both to ten and unknown). It circled the sun every 3600 years, a number likely to be an approximation – the Sumerians had a complex numerology enveloped within their religion, their mathematics set in base 60! I have calculated the orbital period to be 3756 years, give or take a year, a number that clearly does not lend itself to religious numerology. 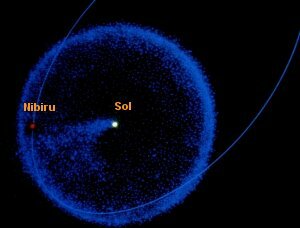 More staggering still is the description of Nibiru’s orbit as that of a comet, complete with a cosmological theory as to how it attained this bizarre elliptical procession around the Sun. The Sumerians held it that the early Solar System was violently altered by the interjection of a wandering planet. This planet was a mighty world which had been travelling through the void, with its company of moons, before falling under the influence of our Sun. It ploughed through the outer system of planets and ended up in an extremely elliptical orbit well out of kilter with the plane of the ecliptic. The point where its perihelion crossed the ecliptic was in the band between Mars and Jupiter, the place of ‘The Crossing’ as the Sumerians called it. At that time, a planet existed there, as predicted in modern times by Bode’s Law. This watery world was known as Tiamat, but it was fated to encounter the mighty Nibiru during one of the latter’s crossings. In fact, Tiamat was struck by one of Nibiru’s moons, a collision that sent the shattered remains of the watery planet into various orbits around the Sun. The gouged core of Tiamat, and one of it’s moons, called Kingu, fell into the inner Solar System to become the Earth and Moon. Other fragments followed Nibiru to become the comets, whilst still others settled into immediate orbits around the Sun as asteroids. This explanation of the current format of the Solar System is as good a theory as any other, going a long way to explaining many of the present anomalies inherent within it; like the disproportionate size of our Moon, the asteroid belt, the comets, the anomalous inclination of Uranus (whose early brush with Nibiru occurred as it first entered the Solar System, before settling into its current orbit), and the major impact basins and Tharses on Mars (the result of the meteoritic fall-out from the collision of Nibiru’s moon with Tiamat). Furthermore, the periodic catastrophic extinctions on Earth could be connected with the occasional cataclysmic passing of this dark star whilst in planetary conjunction with Earth. The only thing missing is the 12th Planet itself. Astronomers have speculated about a companion star around the Sun before. After all, most other star systems are at least binary stars. Ours seems to be an exception. It is possible that a companion has already been detected and catalogued amongst the other dim stars, without its proximity being realised. If it has an elliptical orbit whose long axis is pointed away from the Sun, then its perceived movement across the heavens will be negligibly small. Astronomers have long speculated about a black dwarf in a very distant orbit around the Sun (90,000AU), calling their hypothetical candidate “Nemesis”, a name alluding to their assumptions about the disasterous effect such a usurper would have on the Solar System. It’s name also alludes to the fate of their careers if it’s not found following their proposals! So far, of course, it has not. The argument goes that the closer the brown dwarf/giant planet gets to the other planets, the more apocalyptic the consequences, theoretically leading to extreme elliptical orbits and general chaos. Obviously, the present, settled status quo should theoretically support a model where Nemesis is way out there, and stays that way. With respect to its alleged violent meddling in the orderly Solar System, the 12th Planet myth speaks of much planetary destruction before the planets settled down into their relatively stable orbits. Also, consider the reactions of the astronomical community to counter doom-mongering hype when there is an alignment of the planets. They say that the additional gravitational effects of the planets lining up are negligible compared with the Sun. So an alignment of the planets will have zero material effect on the Earth. So it stands to reason that the periodic passage of a brown dwarf through an empty part of the Solar System would do little other than disrupt a few asteroids, sprinkle a few comets about and cause some environmental effects. But not sling-shot planets about. They can’t have it both ways. So Nibiru is Planet X. It is a sub-brown dwarf with an elliptical orbit of 3756 years (more later as to why I have arrived at this figure) which reaches perihelion during its passage through the band between Mars and Jupiter. Its orbit is inclined to the ecliptic by 30-40 degrees, a finding based upon the description of Nibiru’s journey through the heavens by the observing astronomers of Babylon. Their description also leads to the conclusion that the orbit is retrograde. Nibiru lies in the Southern skies. Much of this data can be found in Zecharia Sitchin’s excellent book “Genesis Revisited”. Sitchin is the scholar who derived and formulated the 12th Planet theory from the Sumerian texts, but much of his work is speculative. Many of his insights are highly challenging, and his work is certainly questioned by more orthodox Sumerologists. But his arguments about the planets as Gods, and the existence of a 10th as yet undiscovered 'planet' is a strong one, and much of the work on this site is built upon this. 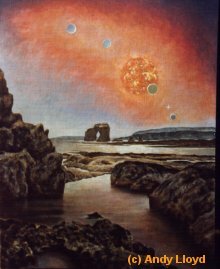 One of my problems with his work is the assumption that Nibiru is simply a large terrestrial-like planet. I cannot see how this could support life in the void on its own. To generate enough warmth by itself, it would either have to be massive (which would exhibit too much gravity) or have a radioactive core (also inconsistent with life). The Sumerians counted the Sun as a “planet”, so it is consistent that Nibiru could also be a failed star. In fact, this would go a long way to explaining why they clumped stars and planets together, through their recognition that intermediaries exist in the form of brown dwarfs. I envisage the home-world of the Anunnaki being an Earth-like moon in close orbit around Nibiru, rather like Europa around Jupiter. A close reading of Chapter 2 of “Genesis Revisited” would reveal many descriptions of Nibiru that sound more like a giant planet or brown dwarf than an Earth-like world. 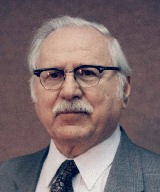 My other departure with Sitchin is with his belief that the Anunnaki lived on our planet in historical times. If this were so, then our historical sources would more emphatically present them as real players on the ancient world stage. They do not. Their very mythological essence indicates their absence. The pyramids at Giza and other extremely ancient monuments may indeed be their post-diluvial handiwork, but I suspect that the start of the Nippurian calendar in 3760 BC marks their momentous departure during a perihelion of Nibiru. This momentous date is also the year the Bible claims as the start of the world, a claim that makes some degree of sense, in that it marks the time when our parental gods left us stranded on Earth to fend for ourselves. Sitchin’s many speculations about the historical presence of the Anunnaki on Earth after this date are, in my opinion, wrong, and tend to make his theory unnecessarily controversial. As if it is not controversial enough! Finally, the date of 3760 BC for Nibiru’s passage through our skies would lead us to the conclusion that its last perihelion occurred in 160 BC, if we were to take Sitchin’s claim of an orbital period of 3600 years literally. The astronomers at that time recorded Halley’s comet in 164 BC, yet no mention of a new star or planet in the sky was made. Yet it must have been seen if it had passed through the Solar System. So the periodicity must be wrong, the figure 3600 meant only as a significant approximation. The only reference to a new star or planet during those times is the Star of Bethlehem. 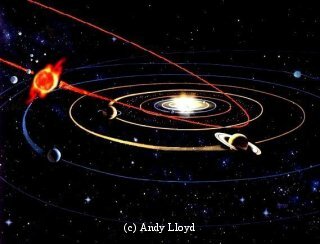 I consider this anomalous astronomical phenomenon reported in the New Testament to be Nibiru as it made its stunning crossing through the Solar System. More on the implications of this later, suffice it to say that it allows us to pin-point the last crossing point of Nibiru to about 4 BC, the date most modern scholars indicate for the birth of Christ. Subtracting 4 from 3760 gives us 3756, the number of years I propose for Nibiru’s true orbit. So the next crossing point will be 3756 years after 4 BC, which, taking into account the lack of a year zero, brings us to 3751 AD. At this point in history, we are more than halfway though its current orbit, which means that it is now slowly starting to head back towards us. In other words, the brown dwarf will be blue-shifting in its Doppler effect, whilst making only the smallest lateral transition through the heavens. As cosmological theory holds that almost all celestial bodies are moving away from one another, then a blue-shifting speck of dim light should be significant. The point is that its motion towards us is far more important than its vectored motion around the Sun. Astronomers will assume that it has a great circular orbit, giving it an orbital period of millions of years. But that is only an assumption. Ancient knowledge indicates something entirely different. I am the first to admit that this is all highly speculative. Without the smoking gun evidence of the discovery of Planet X, Nemesis, Nibiru – call it what you like- then none of this can stick. But if the brown dwarf were to be found, but in a cultural and historical vacuum, then it would simply be a piece of interesting pure science. The impact comes with the application of the scientific method. One looks at the data, sees a pattern, hypothesises and formulates a prediction that is testable. That is what I am doing here. As our ability to find dark celestial bodies increases with our technological advances, and the steady flow of extra-Solar planet discoveries are a testament to that, then the chances of Nibiru being found, if indeed it is even there, are increasing. If astronomers were to announce the discovery of such a body, the implications would be enormous. Firstly, we would be in a binary star system. Secondly, the Dark Sister gives life to a race of extra-terrestrials who share our DNA to a large degree. We are inferior, mortal versions of them. As we learn the science of genetics, we will be able to discard the ape in us and become more like them, increasing our longevity and fulfilling some of our latent powers. Thirdly, our entire religious and social fabric would be threatened. Monotheism would still be an appropriate form of spiritual enlightenment, but the ancient texts would take on a more literal meaning. The New Age would dawn. Other, less obvious, implications would become apparent. The issue of UFOs would take on a new light. It is quite possible that some of the Anunnaki remain in the inner Solar System, either on Mars, on the Moon, in space stations, or even on the Earth. Perhaps a combination of these possibilities. UFO activity might reflect their continuing presence in our affairs. 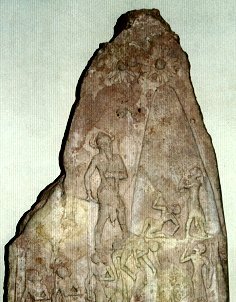 The ‘contactee’ cases describing encounters with the Nordic-type humanoid extra-terrestrials may be related to the Annunaki in some way. The authorities may have quite a good understanding of all this data, and the difficulties inherent in the space industries since Apollo and Voyager may reflect the hidden threat to us from space. The continuing development of a coherent U.S. Space Force, rather than Air Force, could also be a reaction to the UFO presence. It is also not beyond the realm of possibility that NASA’s failures to successfully study Mars are connected with this. The loss of so many of their probes to the Red Planet is a statistical aberration, to say the least. Perhaps the most controversial of the new ideas I bring forward to this discussion regards the appearance of Nibiru at the birth of Christ. I would like to make it perfectly clear that I am not religious, and am not about to put together a religious theory per se. But an analysis of the Biblical story of Christ is called for in terms of this proposal. After all, the people of Earth who had maintained the knowledge of the “winged planet” for 3750 years would have expected some momentous change in human affairs at this Crossing. The Anunnaki may have left their priests with the prophecy that a Messiah would appear when Nibiru returned once more, a Messiah sent by the gods to restore their Kingship on Earth. Following this thread, the true meaning of “King of the Jews” becomes apparent. This all boils down to the accuracy of the story of Nativity. Jesus may have been an historical figure who was deified by later chroniclers who added the occasion of Nibiru’s passing to his birth. This would have added authenticity to his alleged semi-divine status amongst various pagan sects clinging to the divinity of the Winged Planet. But assuming that the events of the Nativity really did take place as reported, then the realisation that the Star of Bethlehem was the brown dwarf Nibiru takes on new meaning. Consider the Three Wise Men. They travelled from the East “following” the Star. I suspect they were senior initiates in the ancient knowledge of Sumerian myth, perhaps travelling from Mesopotamia itself. The prophecy left to them by the Anunnaki may have pinpointed where the emergence of the Christ figure would take place, and in whose lineage he would emerge from. They were ‘followers’ of the Star of Bethlehem in the sense that they believed that it was the planet of the returning gods, or they may simply have watched its slow procession through the heavens over a period of months as it reached perihelion. I do not subscribe to the belief that they literally followed the Star which was leading them to Bethlehem. That sounds more like Ufology than my proposal! Consider the extreme measures taken by Herod prior to the birth of Christ. Conscious of the prophecy, he would have been aware that the appearance of Nibiru as a new star in the sky would herald the return of Kingship, and thus the overthrow of the status quo. Again, his targeted victims were precisely located, which hints at a prophecy that was quite specific. Even the Roman census may have been an attempt to locate the whereabouts of the returning King. The lowly stable becomes a sensible proposition considering the paranoia at that time. Joseph and Mary may have been on the run and keeping a low profile until Nibiru disappeared from view. So what of Jesus himself? It would not be a truly original suggestion to revise the identity of the Angel Gabriel as one the Anunnaki. Like Gilgamesh, Jesus may be half-man, half-god. As he reached adulthood, he may have been contacted once more by the Anunnaki remaining in the inner Solar System, and made aware of his semi-divine status. Perhaps this occurred while he was in the desert. Either way, he would have been assured of his immortality, perhaps given technological devices with which to perform miracles, and sent on a mission to restore Kingship through the teaching of a new era of peace. In a sense, then, the Annunaki betrayed him. The Jewish people were in no mood for turning the other cheek to the Romans. His betrayal, trial and crucifixion were the result of the people’s disappointment that Kingship was not, apparently, about to return to Earth. His resurrection may simply have been a result of his inability to die easily. His appeal to his father on the cross would also take on new light. His ascension to heaven is in keeping with the fate of Noah and Enoch before him, men who left Earth to live with the gods after their Earthly tasks were complete. The Anunnaki clearly would have had good reason to meddle in the affairs of men, without overtly taking control of planet Earth. I suspect that the proliferation of men, and the potential technological advances we are capable of as a result of having their genes within us, makes us a great threat to them. 3756 years is a long time in the history of man, but marks only one passing of Nibiru. Seeing how we had progressed already, the Annunaki may have extrapolated to the next planetary crossing and envisioned a booming human population complete with space travel capability and weapons of mass destruction. Their answer may have been to sow the seeds of peace within us, to create a docile Mankind. It is clearly obvious that that has not happened. Their genes run deep within us, and they are a race who enjoy warfare. If it turns out that the last time of The Crossing was simultaneous with the birth of Christ, then we must ask ourselves why the Anunnaki chose to expose him to the wrath of the humans, who had expected a saviour from foreign tyranny. Kingship was not returned to the world. The gods continued to avoid overt contact with mankind, rather like UFOs seem to give tantalising clues to their origins rather than allowing themselves to become a measurable or predictable phenomenon. When Jesus promised to return, perhaps he did so in the knowledge that he would live with the Annunaki as an immortal, and that the time of the next Crossing, in 3751 AD, would see his reappearance on the world stage. Another point of interest: the use of the sign of the cross as a religious symbol pre-dates Christianity. It was used by the Mesopotamians in the context of the 12th Planet. Christianity made use of this symbol as it developed its religious doctrine after Jesus left Earth. Perhaps the coincidental use of this symbol has further meaning attached to it. Zecharia Sitchin does not cover these possibilities at all. After all, he is a Hebrew scholar and is thus somewhat culturally constrained. Perhaps I suffer with the same constraints, only in my case allowing the science to run away with what is in essence a religious parable. Only the emergence of the reality of the 12th Planet in the guise of a brown dwarf with inhabitable moons would give any real credence to any of this. I am not attempting to redefine a religious faith, only speculating on the outcome of a possible future scientific discovery. This new theory regarding a brown dwarf star in elliptical orbit around the Sun could have a number of interesting applications in the field of Egyptology. Again, as a science, Egyptology is very conservative and such notions would not be seriously considered by the academics. Even so, Nibiru the brown dwarf could go a long way towards explaining several mysteries that have defied rational explanations. "The Egyptians had two ideas about the origins of life. The first was that it emerged in God out of the Primeval Waters; the other was that the essence – Heka – was brought hither from a distant magical source. The latter was the ‘Isle of Fire’, the place of everlasting light beyond the limits of the world, where the gods were born and revived and whence they were sent into the world. The Phoenix came from the far-away world of eternal life… to land, at last, in Heliopolis, the symbolic centre of the earth where it will announce the new age…"
The ‘Isle of Fire ‘ reference is the brown dwarf, around which the home-world of the gods orbits. The Phoenix was said to come from the East, and, rather like the Star of Bethlehem, I think this alludes to Nibiru’s initial appearance in the Eastern skies as it moves through its retrograde orbit through the Solar System. One will recall that the descriptions of Nibiru’s passage made by the observing Babylonian astronomers allow us to place its long axis at 30 degrees off the plane of the ecliptic in the Southern skies. Zecharia Sitchin places this region in the sky around Centaurus or Sagittarius. So as it makes this retrograde passage into the outer Solar System it cuts through the ecliptic at the Place of the Crossing, in the belt between Mars and Jupiter. But its perihelion will occur beyond this, travelling into the northern skies to swing around at the opposite point from its long axis. In past epochs the perihelion occurred in Cancer. The position of the Earth in its orbit around the Sun would have a bearing on the position of Nibiru as it appears against the background of stars, so none of this can be too exact. He smiles his face upon Taurus and Aries; From Taurus to Sagittarius He shall go." I suspect that the description of iron thrones alludes to the gods’ means of transport to Heaven, either in the form of a rocket-ship or Vedic-type UFO. Hancock and Bauval have done tremendous work in the field of archeo-astronomy, and pioneered the idea that the ground plan of the Pyramids at Giza mapped out the region of the sky in Orion. Perhaps this symbolic representation of the Heavens on Earth was representative of the journey of the immortal gods’ world through the sky, a region of incredible importance for the ancient Egyptians as they awaited the return of their god’s star into their skies. 1/ The much sought-after Planet X, or "12th Planet", is in fact a failed star known as a sub-brown dwarf. 2/ It has a variable periodicity, between 3400 and 3800 years, and last appeared during Christ's lifetime It has an elliptical orbit with the long-axis pointing out into the Oort cloud, where the brown dwarf currently resides. 3/ It has moons around it, at least one of them habitable. In fact, a race of god-like extra-terrestrial humanoids could exist there, and may have played a major part in our own evolution. 4/ The location of the brown dwarf lies in the southern hemisphere skies during perihelion, with its orbit inclined at about 30 degrees to the plane of the ecliptic. It is travelling towards us, so its light will be blue-shifted. Its orbit is retrograde. 5/ The periodic passage of this brown dwarf through our Solar System has been the cause of much of the anomalous properties of the other planets, as well as wreaking devastating environmental effects on Earth when appropriately aligned. 6/ Sitchin's "12th Planet theory" has ignored the last crossing of Nibiru, which occurred at the time of Christ. The New Testament may be part of the overall picture, and I provide some speculative ideas in this area. 7/ The presence of UFOs in our skies and around Earth, the pervasive governmental cover-up, the lack of clear progress in space exploration over the last 2 decades, all point to the presence of another intelligence in the inner Solar system. This may prove to be connected with the existence of the Sun’s Dark Sister. 8/ The brown dwarf opens up new avenues for those trying to understand the mysteries of the ancient Egyptians, including the Phoenix, and Osiris in the Duat myths. These conclusions were ones that I came to in 1999-2000. Over the course of time I have discovered many aspects to this research that have brought about changes. The basic tenet that the Sun has a binary companion in the form of a small (sub-) brown dwarf remains, but I am less inclined to think that it still moves through the inner solar system during perihelion. Its orbital properties have changed considerable since Nibiru first encountered Tiamat, but it is still capable of pulling off a few surprises. Science has also moved along in that time, and new discoveries at the edge of the Solar System are bringing astronomers around that our Sun had a companion, at least early on in the life of the Solar System.